EAST LANSING, Mich. — There will be questions about whether Penn State was ready to play, and if the Nittany Lions truly had gotten over their devastating loss last week at Ohio State. That might have been part of the problem, sure. But it’s not why the Nittany Lions lost to Michigan State, 27-24, on Saturday. They lost because their deficiencies were exposed. Penn State can’t run the ball effectively, which is crazy given that they have a superstar in Saquon Barkley at tailback. Also, PSU’s defense can’t pressure the opposing quarterback, which gives him plenty of time to carve up the secondary. Those problems and others doomed the No. 7 Lions on a strange day at Spartan Stadium. Michigan State’s Matt Coghlin booted a 34-yard field goal as time expired to reward the 20,000 or so fans who stuck around and waited out a 3-hour, 23-minute weather delay because of lightning. “We lost two games in a row, we lost to two really good teams,” Barkley said. Penn State (7-2, 4-2 Big Ten) was ranked No. 2 in the country before the back-to-back losses, but now the Lions face serious program questions for this season and beyond. Barkley was held to 63 yards rushing on 14 carries, and 36 of those yards came on one play. The other 13 carries produced 27 yards, and the one-time Heisman Trophy frontrunner has now been held under 100 yards in six of the nine games this season. “In the run game, we’ve just got to find a way to make plays,” Barkley said. Because of the running game issues, it puts extra pressure on quarterback Trace McSorley to carry far too much of the load for the offense. McSorley was 26-of-47 for 381 yards and three touchdowns, so he made his share of plays, but he also threw three interceptions. McSorley didn’t have the most passing yards on the day. Michigan State’s Brian Lewerke torched Penn State for 400 yards, completing 33-of-56 with two TDs and one interception. That came one week after J.T. Barrett completed his final 16 passes and totaled 328 yards with four touchdowns through the air as Ohio State rallied for a 39-38 win over PSU. In both games, the Lions’ defense failed to pressure the quarterback, and they paid dearly. “We’re not getting to the quarterback enough,” Franklin said. “That showed up the last couple weeks. … The best thing for coverage is pressuring and sacking the quarterback. The game was tight throughout, as No. 24 Michigan State (7-2, 5-1) had an answer for PSU’s first two touchdowns for a 14-14 tie at the half. The Spartans took the lead on LJ Scott’s 3-yard TD run with 7:25 left in the third quarter to make it 21-14. The Lions drove inside the Spartans’ 10 on their next possession but had to settle for a 26-yard field goal by Tyler Davis. Penn State regained the lead, 24-21, on an electrifying play when a Spartan cornerback fell down and McSorley hit a wide-open DeAndre Thompkins for a 70-yard score on the final play of the third quarter. Michigan State answered again, though, as Lewerke picked apart PSU’s secondary on a drive inside the 15. The Spartans stalled, and Coghlin tied it at 24 on a 32-yard field goal with 10:56 left to play. McSorley threw an interception on PSU’s next possession. With the Spartans driving, Lewerke had a pass tipped by his receiver, and it was picked off by Amani Oruwariye at the 7. Penn State put together a nice drive looking to retake the lead, highlighted by a 20-yard pass to Juwan Johnson that also included a 15-yard roughing the passer penalty. That moved the Lions to the MSU 38. McSorley, though, was flagged for intentional grounding on second down, putting PSU in a third-and-19 hole. McSorley connected with Barkley on the left side for a 16-yard gain, setting up fourth-and-3 at the 31. It would have been a 49-yard field goal from that spot, on a cold, soggy day. Davis and the field-goal operation have had a lot of problems this season — the kicker was just 7-of-14 coming in, with a long of 47 yards, which is also his career long — and Franklin opted not to try for a long field goal. The Lions instead went for it and had the right play called on a quick slant to the right to Thompkins. McSorley’s pass was just a tad bit high but still catchable, and Thompkins had the ball go through his hands for a very costly drop. Michigan State took over at its own 31 with 4:05 left, and Lewerke hit a couple of 9-yard passes to help move the chains. He reached 400 yards for the day on a 6-yard completion, setting up third-and-4 from the PSU 37 with 53 seconds to go. Penn State’s struggling secondary did come up with a big play as freshman Tariq Castro-Fields broke up a pass to Cody White. But Lion safety Marcus Allen was flagged for a 15-yard roughing-the-passer penalty as he hit Lewerke late, and replay showed it was the proper call. That penalty put the Spartans at the Lions’ 22, already in field-goal range and with an opportunity to run the clock all the way down before kicking. Michigan State called timeout to bring on Coghlin with 4 seconds left, and Penn State called a timeout to try and ice the kicker, who was just 7-of-11 on the season coming in. Coghlin drilled the 34-yard kick, giving the Spartans the victory and dropping Franklin to 0-10 in his career against ranked teams on the road. 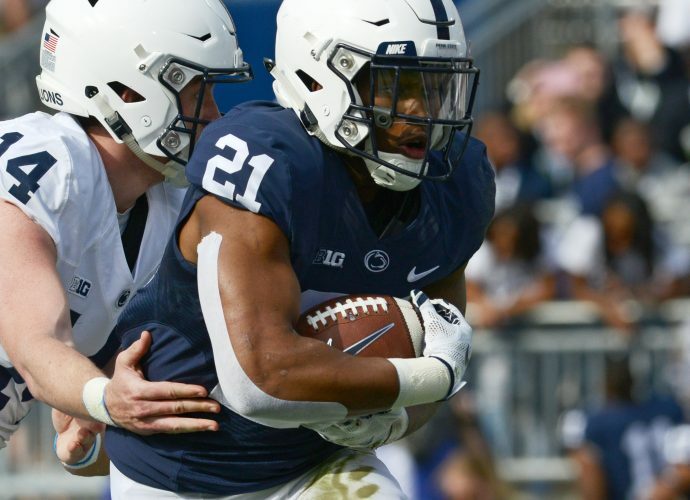 The PSU team leaders organized a player-only meeting last Sunday and talked throughout the week about being focused after the loss to Ohio State.